To my readers who are accustomed to hearing about the general Naperville fare that I dish up with somewhat regularity, I hope you will indulge me in sharing my thoughts on some pointed life realizations I’ve had recently which I think might be either familiar or helpful to others out there trying to pursue the many dreams we have in our lives. I returned last evening from a futurist conference for my industry which focuses on the role of technology in association leadership. We spent three days observing, considering and imagining the future ahead of us in the way people will engage and interact as they carve out their identities in this new world on both a personal and professional level. We even took a trip into brand new technology which represents perhaps the first form of pseudo-artificial intelligence which will usher in the web 3.0 era. Being wrapped up in the promise of lofty hopes and apsirations for “tomorrow” and moving around in what most of you know to be another one of my favorite worlds, Walt Disney World, I found myself contemplating my own dreams for the future and recalling the hopes and dreams which have led to the present day. We spend a good deal of our lives in the quest to attain our goals and dreams… our dream job… our dream house… our dream relationship… our dream car… our dream everything. What we often fail to consider is what it means to attain a dream and what it feels like to actually get there. Sometimes in life we climb mountains only to look back down and remember how wonderful life in the valley used to be. We hope to find the time to relax and reflect, yet the higher the steep narrow landscape of the summit grows the greater the demands on us to continously find ways to not be blown off of the peak. Further, once we reach that which was a beautiful summit from a distance, we often find discover it turns out to be more harsh and jagged terrain than we expected. Sometimes we find ourselves lamenting all that we left behind and that which will never be again. With that said, it seems to be that a “dream” is an ideal, and sometimes intoxicating, vision of something inherently imperfect in reality. I feel very blessed that I’ve attained a number of my “dreams” in life yet most often I find that the attainment of a dream either brings unexpected complication to life or signifies the beginning of a new journey. Dreams don’t often live up to our internalized hype, which explains the reasoning behind the notion that the journey is the destination. As I sat on my balcony at Disney’s Contemporary resort Wednesday evening overlooking the Magic Kingdom fireworks, I encountered the type of pause in life were it all starts to hit you. I thought of the many trips I’ve taken to Disney over the years during many different stages of my life. I recalled the hopes and dreams that have come and gone through each chapter of my life. I thought about the people in my life who have come and gone, some who I will never have the pleasure to speak with again. I thought about how fast my children are growing and lamenting those days I will never see again. I thought about experiences from my past which only exist in the time capsule of my mind. Then it dawned on me. Regardless of our life’s aspirations, our true dreams are unfolding around us each and every day. Those unassuming moments which sometimes slip past us in our busy plight. Those moments in life where if we could just see beyond our stress, fatigue and frustration we could look closely and see that magic is unfolding all around us. How do I know these things to be true? It’s because as I’ve grown older, the most powerful dreams have become those of days lost… those moments I failed to appreciate because I was too busy chasing my dreams of the future. I’m pleased to report the completion of a new installation of black & white Downtown Naperville photography from my personal collection in the west lobby entrance of the 1240 building at the Naperville Corporate Center located on Diehl Road. The collection was commissioned by Alyson Erwin and TVS Interiors of Chicago on behalf of Transwestern Investment Group, the company which owns and manages the property. The installation consists of five framed and matted 20×30 black & white images covering the Riverwalk, Dandelion Fountain, Municipal Bandshell and other familiar Downtown Naperville landscapes. I dropped by last week to take a first look with my three year-old and as I stood their in a humble moment of pride I looked down to my little guy to capture the expression on his face and he had already left my side to run back to the alluring waterfall. Forever grounded and humble indeed. 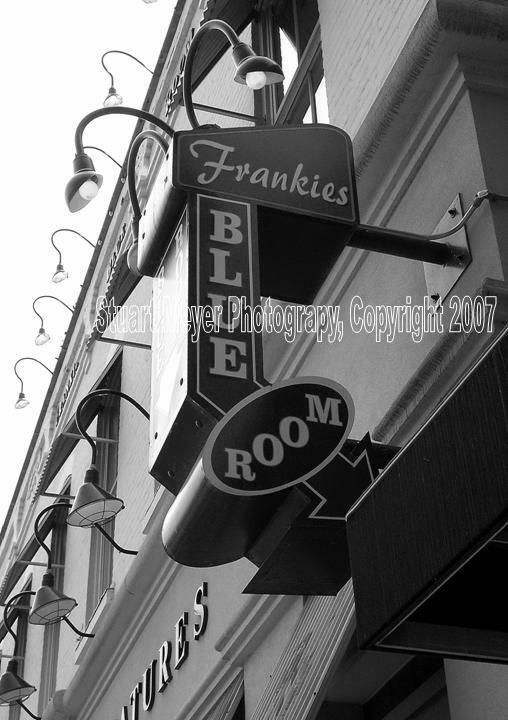 I selected this b&w photograph of the familiar sign above the entrance to Frankies Blue Room for the renewal of my ‘photograph of the week’ posting. A cornerstone of Downtown Naperville’s entertainment district, Frankies is located on Chicago Avenue just between Washington and Main. A big Naperville greetings to everyone. I’m pleased to report that we are now fully settled into our new Naperville dream home and I look forward to getting back on track with new postings. So much has happened over the past few weeks I don’t know where to start. Our move has led us into the realm of South Naperville which has been an interesting experience already. Within days, I suddenly have a newfound appreciation for what South Napervillians have gone through for the past 5-10 years. It is definitely a different path we travel to meet our daily needs. Nonetheless, it is mighty peaceful down here. The good news is we aren’t far from the great 75th Street dividing line as well as Washington Street. The neighbors have been great so far. We could have a chocolate chip cookie bake-off for all of the wonderful salty and sweet confections we have received. I have to give major props to my seven year-old who decided to jump right in an switch elementary schools rather than finish the year at his former school. In his own logic, he wanted to get started so he could make new friends for summertime. Ironically, one of his classmates lives right across the street. I also have to say great things about Naperville-based Prager Moving. Quite a different experience from when we moved to Naperville from Chicago five years ago with our beer-drinking moving crew. The team working for Prager was not only super-careful and efficient, but they also were very friendly to our boys amidst the chaos of emptying the house onto the moving truck. Best of all, the unload went great and after unpacking everything I’m pleased to report that not a single item was broken nor was anything damaged. Best of all, I’m thrilled that we have switched from DirecTV to Comcast and now have full access to NCTV 17 of which I’ve finally enjoyed watching after five years of not having my NCTV.